Shut the front door. I made a book! The Official Guide to Living with DINOS is on sale. Right now. This tiny book took me so long to get done that I thought it would never happen. But let’s be honest. It once took me an entire year to make a tri-fold pamphlet.. I’m nothing if not slow moving. Weighing in at just over 60 pages, my book is technically a booklet. I think the let makes it sounds more mysterious. Like it’s a French woman who, unlike me, knows how to wear a scarf the right way. 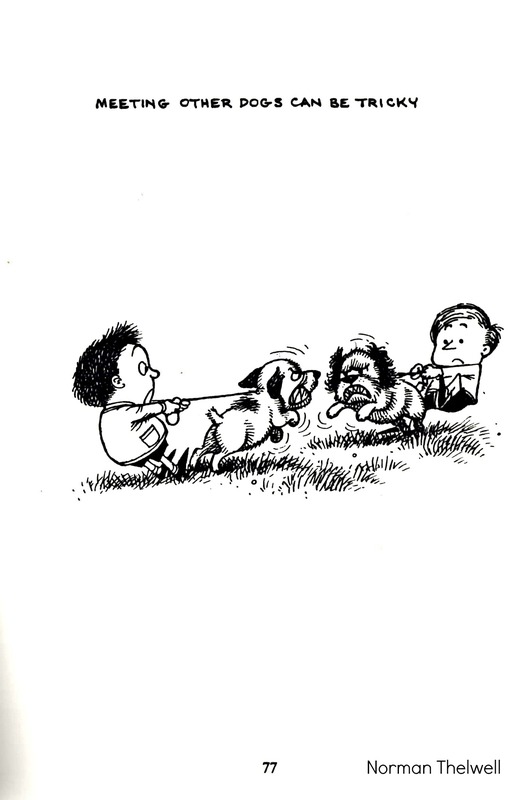 And no, the book isn’t about dog training. It won’t tell you how to fix your dog’s problems (I’ll leave that up to the experts). The guide is all about how to make it through the day with a dog that needs space. It’s a 60 page pep talk with practical tips. I know you guys with fearful and reactive dogs are the ones struggling the most, so you were at the front of my thoughts as I wrote this. I’m hoping that dog trainers, dog walkers, and shelter workers who have clients that are feeling really down about their fearful and reactive dogs can offer up the booklet as support. So instead of feeling isolated and overwhelmed, the newbies will feel empowered and excited about living with their not-so-perfect dogs. I was definitely writing the booklet for people who are brand new to the DINOS scene, but I think some of you who have been around since day one will really enjoy this too. Crying! Laughing! Snuggling! What more can you ask for from a booklet, right? Seriously though, Jenny’s feedback was the kindest and I hope – down to my toes – that you all feel the same when you read it. You can pick up a print copy or ebook on Amazon. Or you can buy a print copy straight from Createspace. Finally, a big fat thank you to Jenny for the editing and feedback, Nat and Bill for the gorgeous cover design, and my mom for the encouragement, proofreading, and for pointing out that using the term “stewardess” in the book was old fashioned and kind of sexist and, uh, maybe I should use “flight attendant” instead. Good call. Thanks mom. Want to win a free print copy of The Official Guide to Living with DINOS? 1. In the comments tell me: Your dog just published their first book. What’s the title? 2. The deadline to leave your comment is Monday 4/27/15 at midnight EST. 3. One comment will be chosen using randomizer. On Tuesday 4/28 I’ll announce the winner here and on Facebook. I’ll also contact the winner via email to get their mailing address, so I can send out the book! 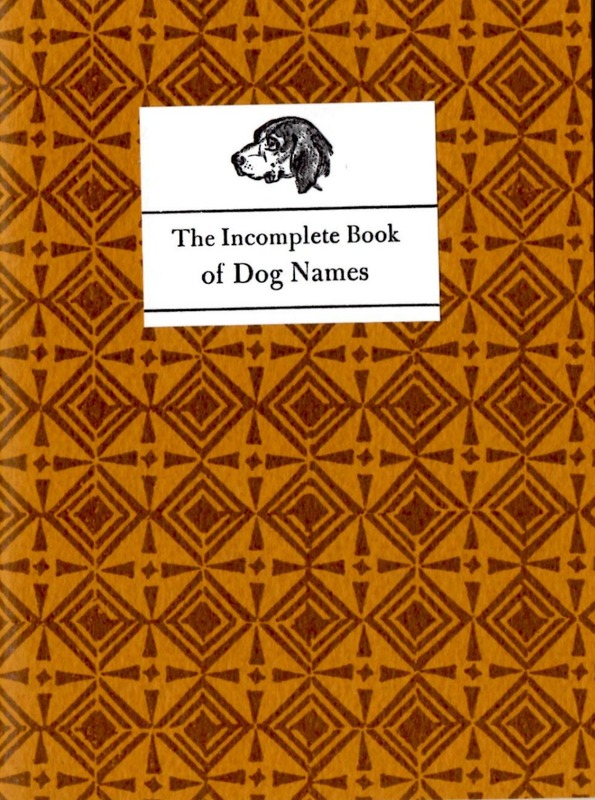 So go, one tell me: What’s the title of your dog’s book? 4/28/15: The winner was just drawn….Congratulations goes to Hannah of Eriesistibull! Thanks to everyone who commented. Your creative answers always make me laugh!! 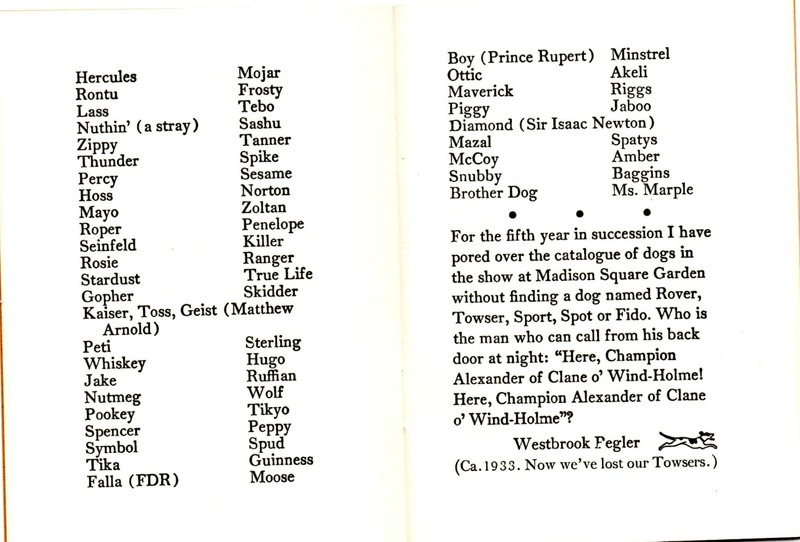 There are pages of dog names, most of which fell off the Top 10 Most Popular list long ago. Many of the names are historical and literary in nature, which I dig. Personally, I’m putting Ms. Marple on my Names-for-Future-Dogs list (right next to Hoagie, which currently has the #1 spot). You guys have a list like that too, right? You can purchase your own tiny copy here. p.s. for those of you who work or volunteer with animals, I’ve been writing about the emotional side of our work over on my new blog. If you want one easy place to find everything I’m writing about, you might like to subscribe to my monthly(ish) e-letter. I’ll be sending one out next week! 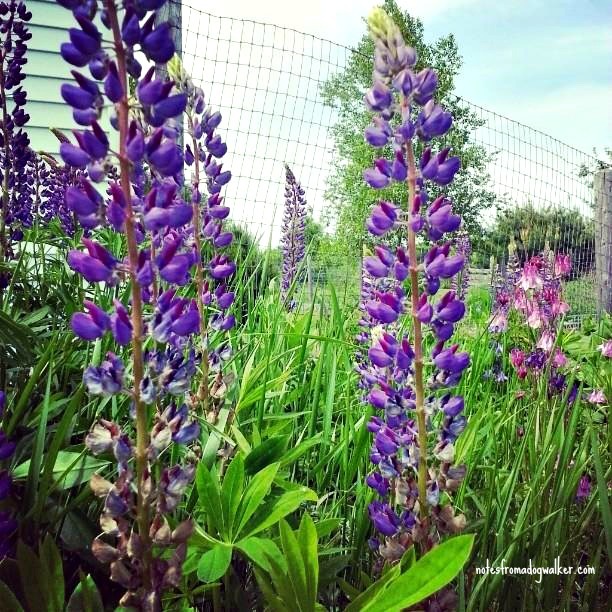 It’s lupine time in Maine. Not too shabby. I just discovered Evernote (I know, I’m kinda late to the party). It is flat out rocking my world. One of my oldest friends, photographer Ryan McGinley, just gave a fabulous commencement speech at Parsons. If you’re an artist, you’ll want to watch it. If you’re not, watch it anyway. It’s that time of year here in Maine: bug bites, rashes, and other dog boo boos abound. Bad Rap’s classic post has some good advice. Dogs Out Loud reminds us to catch our dogs doing something good. Amen to that. 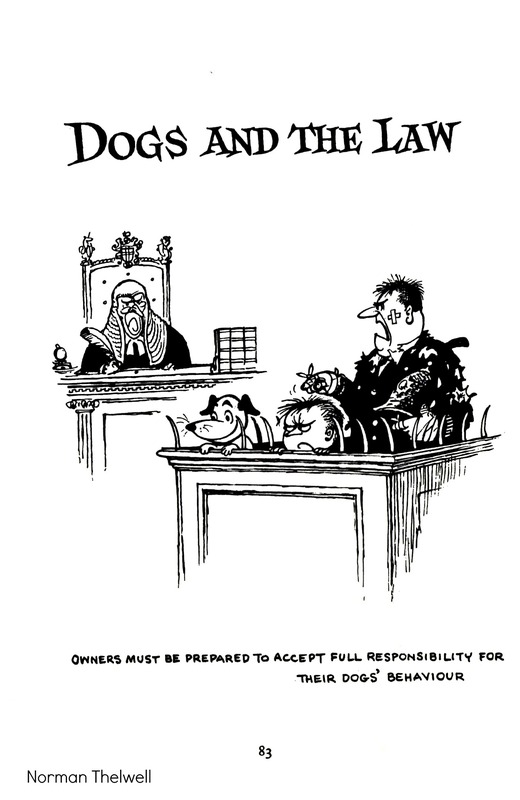 Did you know dogs used to (literally) rule? Meet the Dog Kings. Finally, I have a pro wrestling persona (I bet a few of you can relate)! I just listened to the audio version of Into Thin Air, which had me running to Netflix to watch the IMAX Everest movie. And I’m currently laughing my way through Sister, Mother, Husband, Dog by Delia Ephron. What about you? See that quote above. Phew. That’s a biggie. 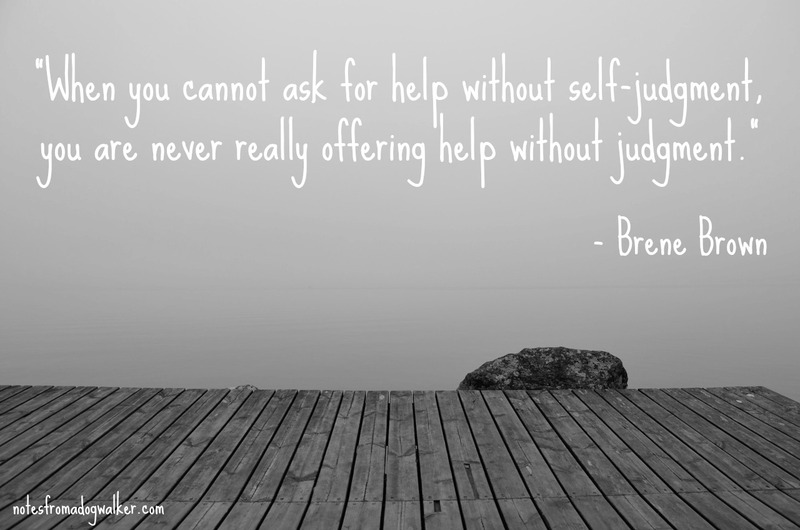 Do you have a hard time asking for help? I do. Watch this. It’s short but it’ll blow your mind. I am addicted to taking classes and this one is next on my list. And I think we should all be wearing this. Lately, I’ve had a few people ask me for resources about medications for fearful and anxious dogs. Here’s a good place to start. Vintage photos of dogs on the high seas. Ahoy! I may have shared this before, but I recently passed this along to some friends and thought, what the heck, let’s make sure everyone has a copy of “Relax on a Mat” from Whole Dog Training. I just discovered a new cartoon to keep me in the laughs. Meet The Rut. Along with some textbooks and a stack of magazines, I’m enjoying Hardwiring Happiness by Rick Hanson (author of Buddha’s Brain). It’s brain science and I can still understand it. So bonus. What about you? Books? Classes? What are you learning about these days? 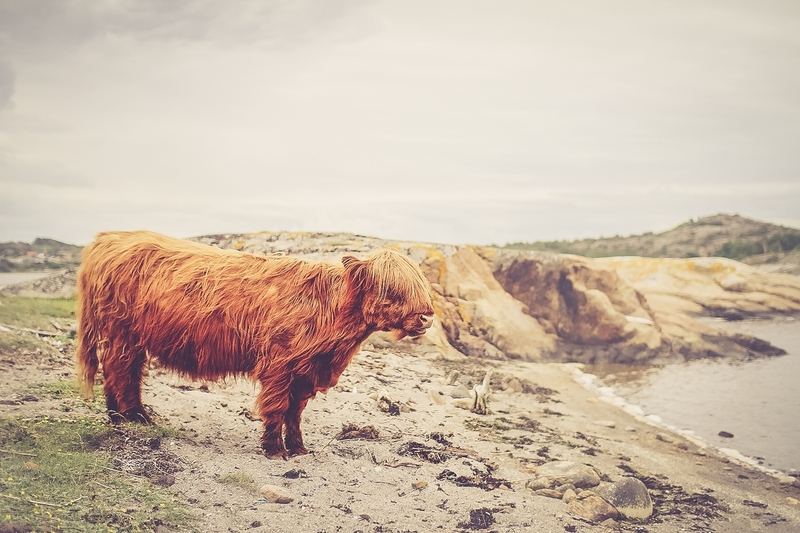 I wish someone would hire me to pet sit a Highland Cow (otherwise known as a “hairy coo!”). Old folks and young whippersnappers swap clothes. Sweetness ensues. Photos here. How to say “no” to everything from smarty pants Alexandra Franzen. Someone please make this for breakfast and send me some. Thanks. Does your dog hang out at dog parks? Please read this. Renting with dogs can be tough, particularly if you have large dogs or certain breeds. Good advice here. 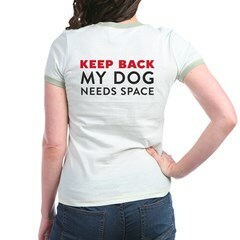 We should all get this t-shirt and this pillow (or just send them to me with that breakfast you’re packing up). I can’t stop watching this video. It’s not new, but man, it’s the funniest. I’m reading Full Catastrophe Living by Jon Kabat-Zinn. How about you? Any good books keeping you busy this chilly winter? 1. I’m currently taking a graduate level course to help me decide if I want to go back to school and get my master’s degree. Homework is happening. 2. 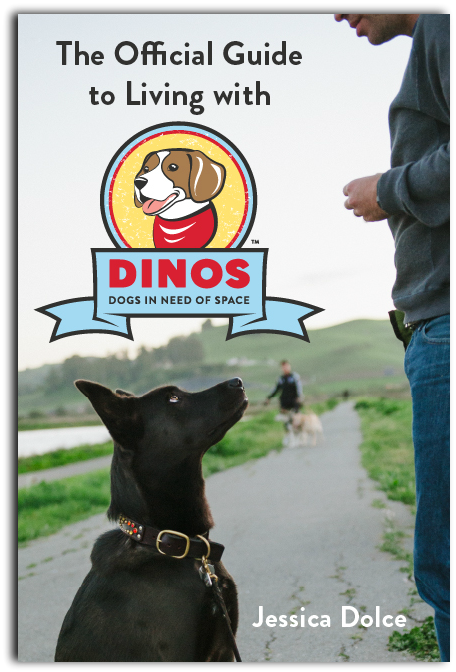 I’m working on a DINOS eBook! So far it’s shaping up to be the best of my blog, with a bunch of new essays and helpful tips thrown in for funsies. I’m writing it for the newbies who are living with DINOS for the first time. It can be overwhelming and they need a one-stop booklet to help boost their morale. 2a. The stuff I’d normally publish here about DINOS is getting saved for the book. 3. And I have to go to work. Those pesky jobs and their silly paychecks. I find that the best way to deal with an impossibly long to-do list is to run away to the movies on a Sunday afternoon after doing a little thrift store shopping. Am I right? 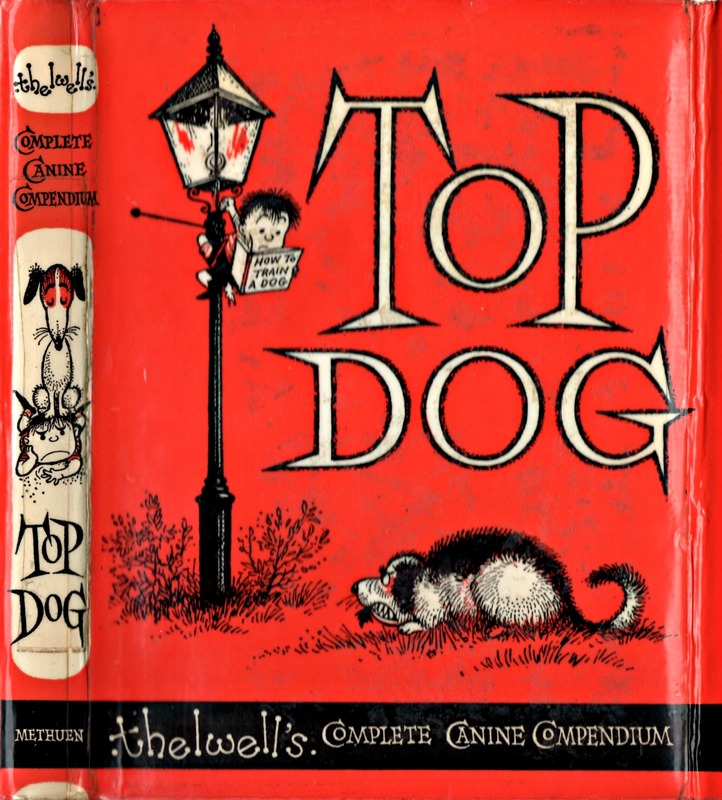 Published in 1964, this gem of a book is a compilation of the British cartoonist Norman Thelwell’s Sunday Express illustrations. 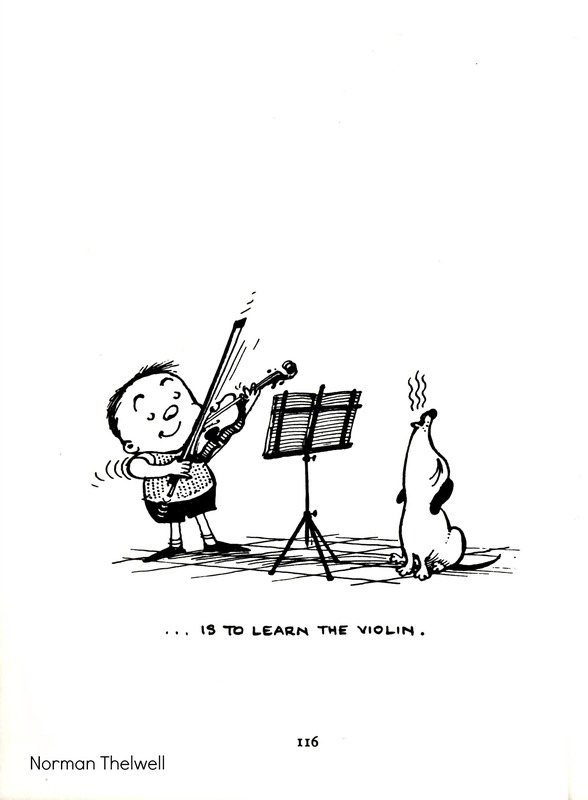 …is to learn the violin.” That is, by far, the most sensible dog training advice I’ve ever gotten. 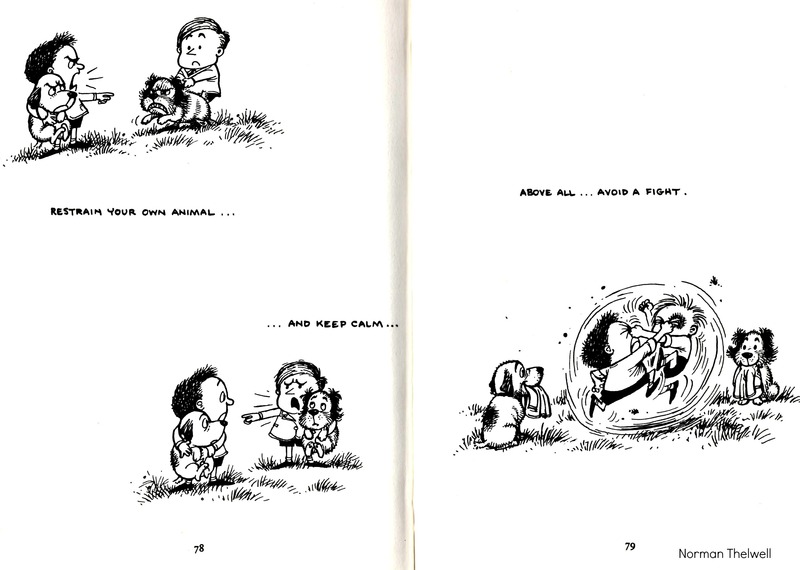 There is an entire section devoted to how to handle your dog outdoors (clearly Thelwell was an early member of Team DINOS). 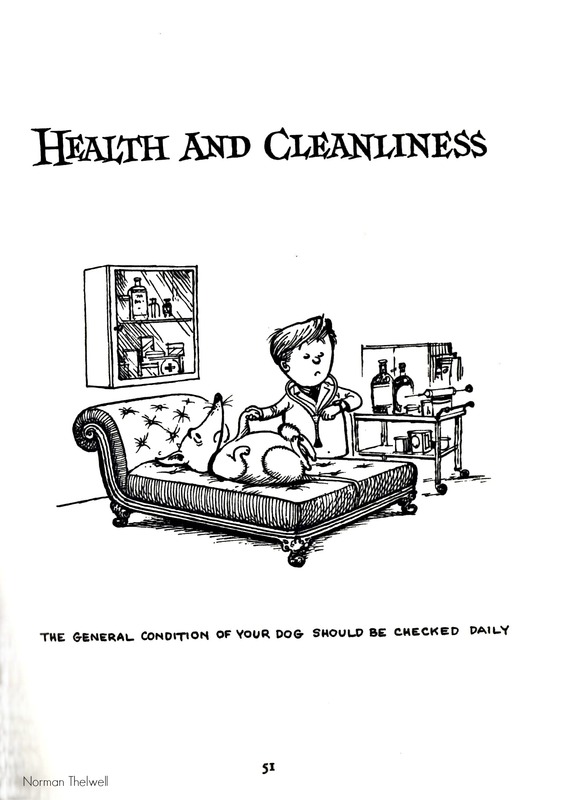 It’s a wonderful book, filled with cheeky text and illustrations and more than a few surprisingly helpful and progressive tips for real life dog care. If you ever come across a copy, scoop it up. And now, it’s back to work for me – see you guys soon! 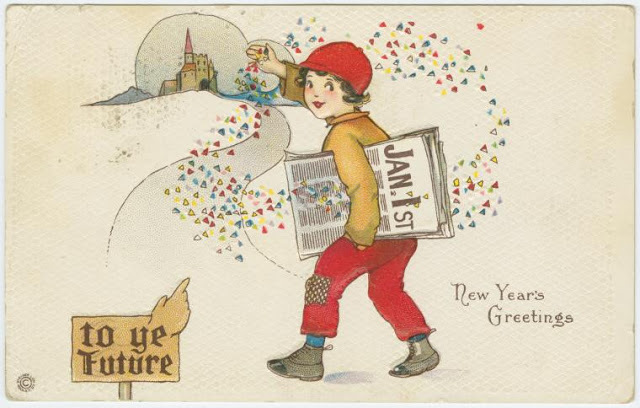 It’s still New Year’s right? We get until February before it’s Ye Old News, I think. Being busy isn’t a badge of honor. It’s not enough to just be busy. How are we really using our time? The award for best cartoon tribute in the “Man + His Cat” category goes to this dude. Please read this one. 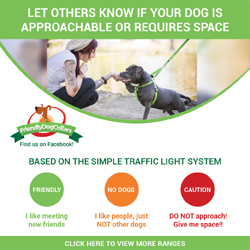 It’s going to help you and your dogs. Pinky swear. Are you following The Dogist yet? I love these photos of dogs on the streets of New York (and elsewhere). Imagine waking up to this. I’m taking a night class right now so these days my offline reading is heavy on books related to Adult Education. We’re discussing Julia Cameron’s The Right to Write. Ever read it? She’s the woman behind The Artist’s Way. In another lifetime I worked at an Irish bar in Philadelphia called Moriarty’s. The staff back in those days was a pretty awesome bunch. 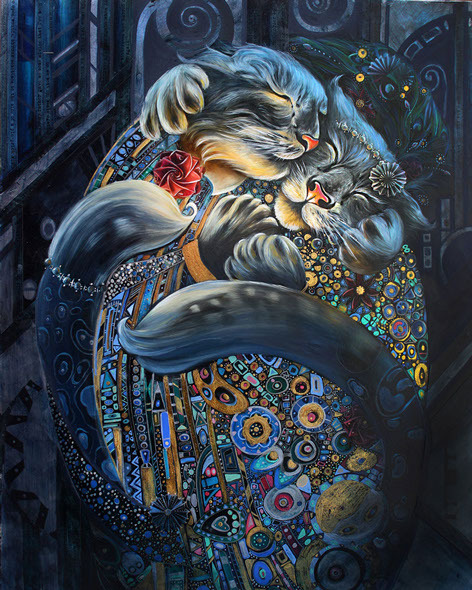 One of them was the artist Christina Hess. 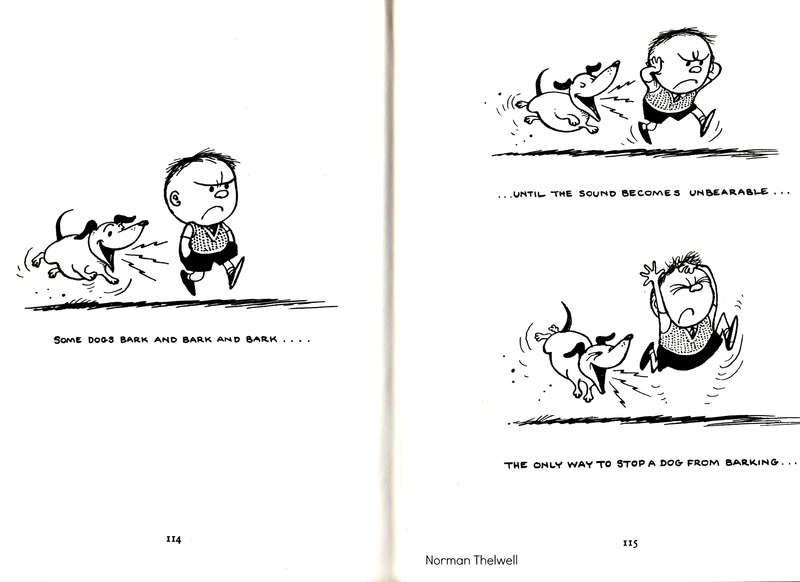 I love this series of illustrations. A lot. Lucky for me (and you) Chris was up for a few questions about her work. Let’s dive in! Jessica: What was the inspiration behind Animals From History? Christina: Animals and history always interested me, but this project came together for a few reasons. I painted a white cat (Queen Elhissabeth) for a client who wanted his cat immortalized as a queen. I did some research and felt that a generic queen would not have been as fun to do as someone that actually existed. 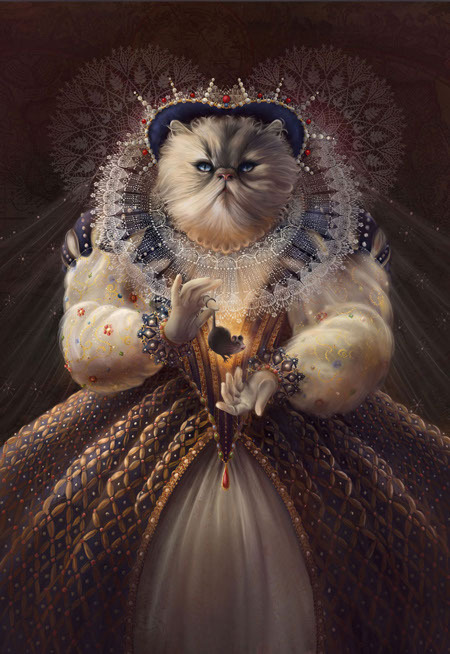 So I researched Queen Elisabeth and I found wonderful imagery that I could pull from. It ended up resonating with many people. Another inspiration was our Basset Hound, Roscoe. He was a character and gave me a lot of stories. I often wondered what he would be saying if he were human and I coincided his rumbles with famous quotes or lyrics from songs. At that point I felt like it would be a really fun project to bring together animals and history to make a world that I could continue working with. 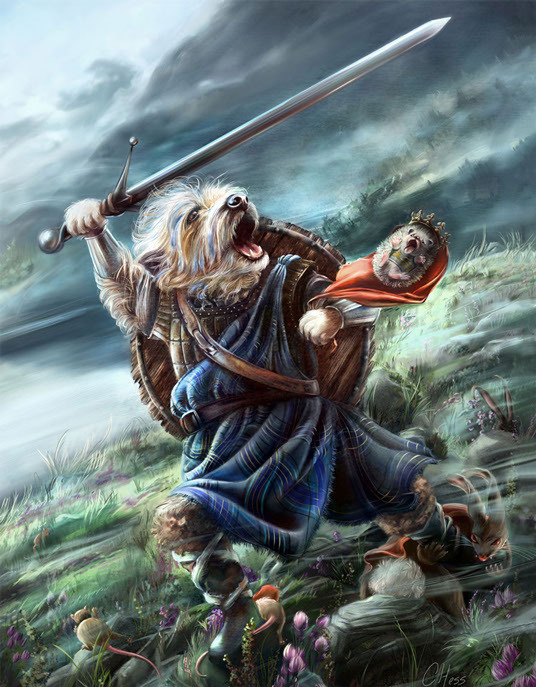 J: Now that I’ve seen William Wallace as a scruffy terrier and Joan of Arc as a dignified German Shepherd, I can’t imagine them as any other kind of dog. How do you choose a particular animal and historical figure pairing? Does the person’s animal alter ego speak to you or vice versa? C: It’s funny because when I first started this idea I had wild animals involved and had animal/human personalities match up. But then it took a domestic animal turn. 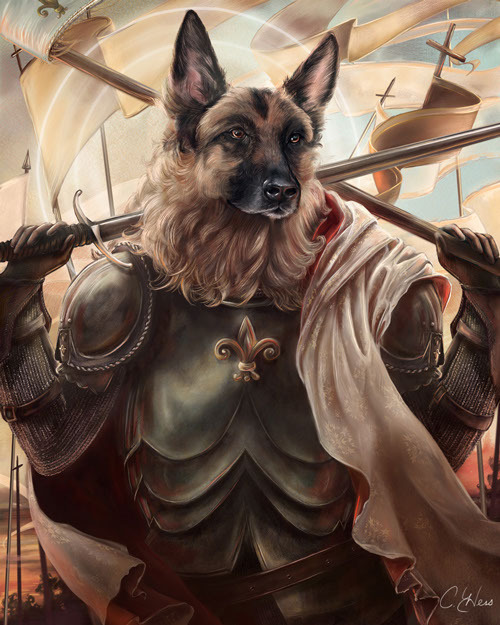 I had used Kickstarter.com for funding the project and through that I offered original artwork of people’s pets as their choice of historical figures. 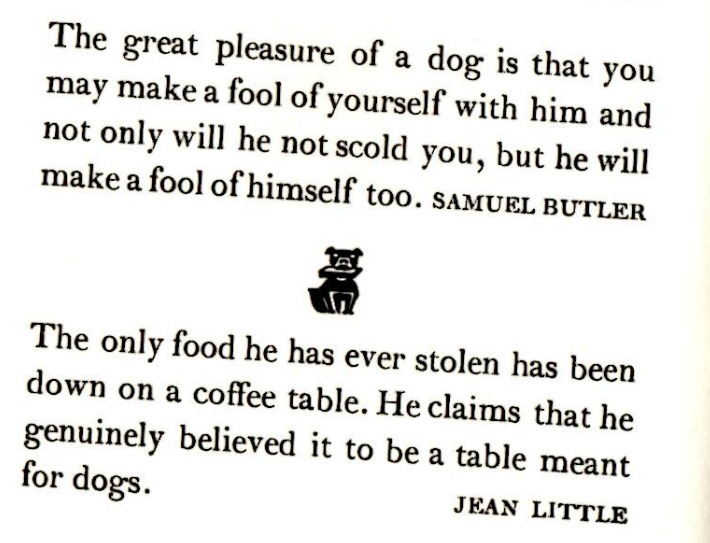 What I found is that people did not associate their pet as a personality because of looks or general attitude – it was all about the individual animal. 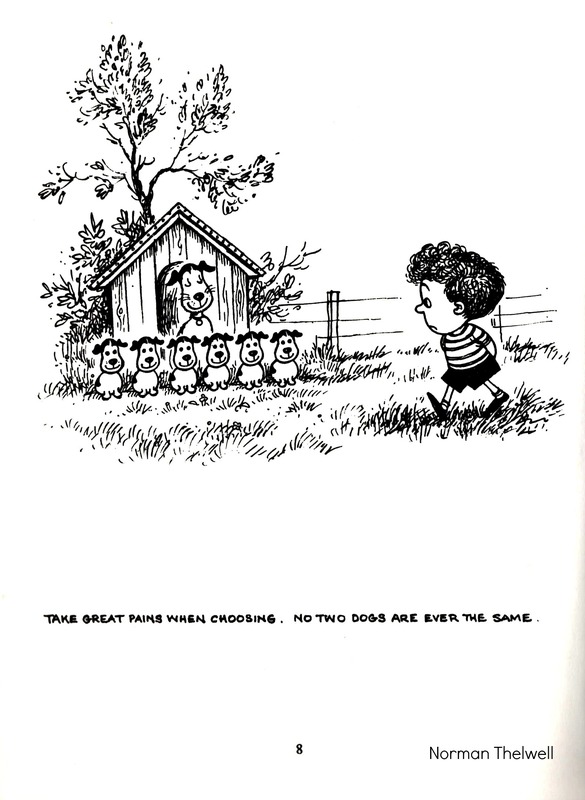 Sometimes the choice lined up perfectly – like Kiddy Roosevelt. The cat really looked like Teddy Roosevelt! It really became a community project and I learned so much about people’s pets. For example, the dogs behind Joan of Bark and Henry V are canine siblings in real life. When “Henry” moved in with “Joan” she terrorized him quite a bit. So their owner and backer thought that two opposing personalities were appropriate for both of her German Shepherds. With the wild animals I wanted to pair the personalities of them with the people. Snow leopards rarely stay together, as The Fitzgeralds did not. Mountain Lions are loners who are ruthless, hence the portrayal as Steve Jobs. 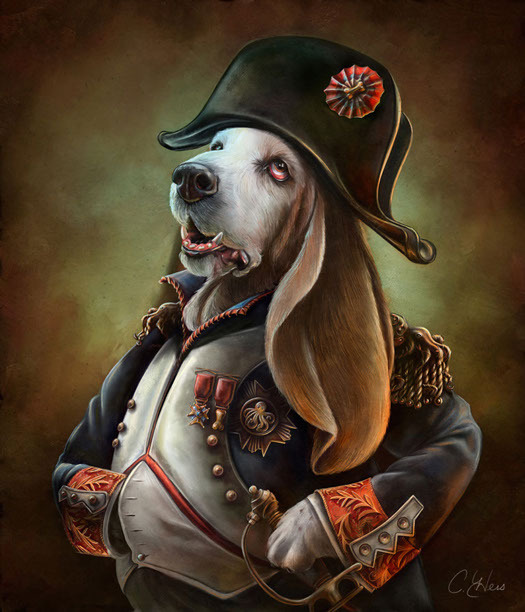 J: Your late dog Roscoe, an adorable Basset Hound, is depicted as Napoleon. What inspired that particular pairing? C: The obvious short man syndrome applies to his breed a lot. Those Bassets act like big boys, including my Roscoe! He was also very vociferous and had a bit of prissiness to him that reminded me of Napoleon and his pushy personality. He was short, pushy, loud, obnoxious and loved french bread. I’m not kidding…bread was his catnip! He had a big personality, as did Napoleon. Also, I really wanted him to hide his paw, so it appears he is scratching his own belly. J: Is there an animal or a historical figure you’re dying to bring to life next? J: Where can we see more Animals From History? Is the Ebook available to purchase? C: Right now the images are online at ChristinaHess.com and AnimalsFromHistory.com. I also have them for sale in print form and in a 2014 calendar. I had to postpone the eBook, because I’m reworking some of the writing in order for my agent to pitch it to publishers. Hopefully it’ll be out by next year. I’ll keep you posted. Wish me luck! I can’t wait for the book – I have no doubt it will be a huge success! Thank you for the interview Chris! 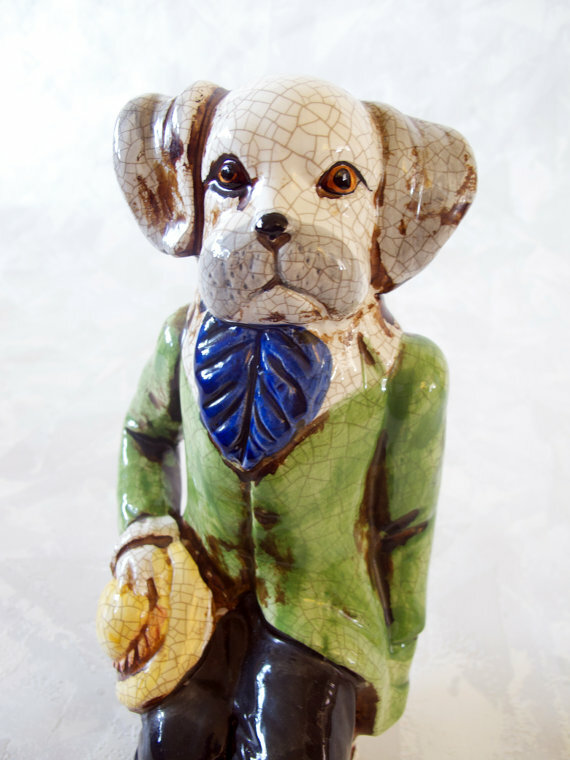 If you have a couple hundred bucks to spare, this vintage Dapper Dandy Dog can be yours! I shared this helpful blog Will You Be Coming Home to Your Dog Tonight? on Facebook earlier this year but: 1. it’s too important to forget, so read it again and 2. there’s an update at the end from medical and emergency personnel that you may have missed the first time around. A collection of vintage photographs of Man’s Best Friend. I’ll tell you my favorite, if you tell me yours! This is what a porcupine sounds like when it’s having a snack. You need this right now. What Captures Your Attention Controls Your Life. I am controlled by dog turds and cat yak. There are rules to city walking. Get to know the Step-and-Slide and do some urban strolling like a pro. Don’t miss the soulful jingle in the video. Best lyrics ever. And Offline: I’m reading so many books and magazines and articles right now that I’m not sure which end is up. I just listened to The Great Failure by Natalie Goldberg and if you’re into Buddhists, Jews, New Yorkers, complicated relationships, and writers (I am!) it’s amazing.